People with dementia are often prone to wandering or have difficulty finding their way around, even in a home or care setting where they have been for a long time. Our range of purpose designed, high visibility signs for every location provide a cost effective way to help remove a potential source of stress and prolong independence. 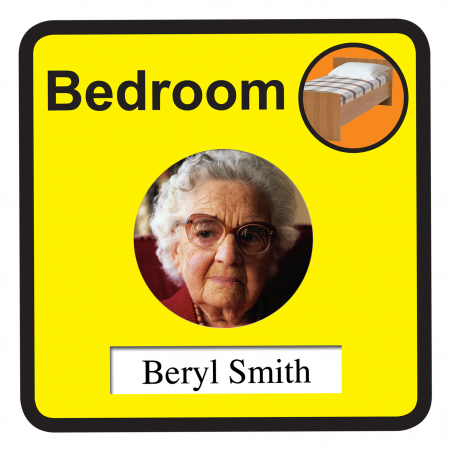 Corridors frequently all look the same in a care home setting, so personalised bedroom door signs can help people to find their bedrooms more easily. Our easy-to-change solution looks neat, tidy and doesn’t require hand-written names. When a new resident moves into a room, the name and photograph can be easily changed. Simply print off the person’s name and drop in a photograph, cutting to size where necessary. The signs feature simple wording in a clear typeface, reinforced by an easily recognised image, and in high contrast colours for maximum visibility wherever they’re sited. Made from durable, high quality materials, the signs are non-reflective and easy to clean. They also feature smooth edges and rounded corners for safety. 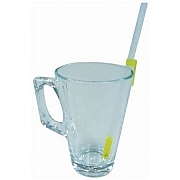 The strong acrylic adhesive on the back makes them easy to fix securely without tools and difficult to remove if people with dementia inadvertently tamper with them. Because there are no screws, they won’t compromise the fire rating either when fixed on a door. Ideal aid to room recognition for people with dementia. Easy to change names and photographs. Neat and tidy, no need for handwritten signs. Suitable for all care settings. High contrast colours for maximum visibility in every location. Easy fixing, no tools required. Simple room description in a plain typeface. Made from durable, high quality, fire rated materials. Smooth edges and rounded corners for safety. Non reflective, wipe clean surface. Stock items despatched within 24 hours. If an item is out of stock, we will contact you by phone or email as soon as possible. Standard delivery charge £5.95 (inc VAT). Special offers may be available. Please see our Delivery page for more details of Highlands and Offshore rates as well as technician deliveries. For those eligible for VAT relief, this product can be purchased with NO VAT. Please indicate your eligibilty during the checkout process. © 2019 by MAKERFIELD Ltd.